65th Favors. 1950 Magnet. 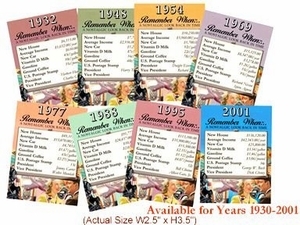 These 65th favors are ideal when you are needing 65th birthday favors. The top of the magnet says Remember When and it leads you down that nostalgic path to years past. Try them out for 65th anniversary favors too. These are appropriate for any gala event you might be holding. The listing of 9 events and prices makes the past come alive for anyone born in 1950. Our 1960 magnets measure 2.5" w x 3.5" h and the year, and a couple lines of 1960 facts. you'll see the price for buying a new house and drool over the old prices. Great 65th party favor! Cost listed is for one magnet. See also our other 65th gifts.